If you are a beginner in the world of beards and beard trimmer, you can go for this one from Hitachi. 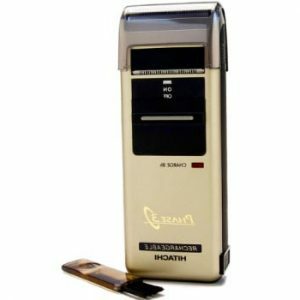 It is suitable for those who does not have too much beard but needs the trimmer to take care of it and maintain it. It is a trouble-free solution to your grooming needs. If you are confused about which one to buy because the market is full of numerous options, you can select this. If you do not have the thickest or the bushiest beard, there is no point in spending hundreds of dollars on a beard trimmer. When you see the box, you will get to notice that it follows the Japanese design. It is a small box, the exact size to hold the beard trimmer. When you take it out, you will the trimmer, comb, a carrying pouch and cover to protect the foil. The pouch is not that fashionably built so you cannot take it out. It is for use at home only. When you do not need the device, store it in the pouch along with the foil protector. Even though it has a metallic appearance, it is actually painted plastic. The plastic body makes it not so durable or strong. It looks like a radio from a distance. If you do not take care of it, there will be scratches on the paint. When you want to use, just plug it in directly. You have noticed that other beard trimmers must include a charger and cable in the box. This device did not have that. That is because you can directly connect it to the wall using the AC prongs. People who used wireless beard trimmers before know the trouble of connecting the device for charging and using it in a cordless manner later on. There is a lot of trouble. The cables make a mess, they can more space and it is difficult to travel with them. In case you forget them, there is no way to charge the device. The battery of the Hitachi RM 1700 UD is strong and you do not have to worry about replacing it. All you need to do it plug it in when you need to use it. There is a light that will tell you if it is charging. It is perfect if you are travelling. Firstly, because it is small and light. Secondly, it does not require chargers, cords or cables. Thirdly, it can change from 100 to 120 Volts to 200 to 240 volts. The blade is similar to that of Braun’s mobile shaver. The difference is that the Hitachi is linear in patter when you see it from above. It does not miss any hair unlike the Braun one. This could be your solution during travel because of its feature to be portable. If you have thick beards or stubborn hairs, you might want to have another beard trimmer for regular use. It is not waterproof so you must not make it come in contact with water. This entry was posted in Hitachi on January 2, 2018 by Professional Beard Trimmer Reviewer.